Tracey Couret is the technology coordinator at St. Scholastica in Covington, LA, and she is in the process of getting her Master's in library science. She did a practicum with me a couple of years ago. 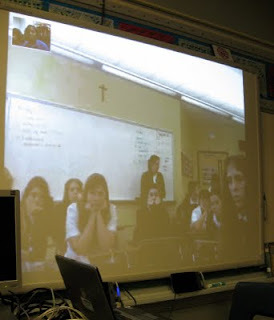 We both attended a workshop a few weeks ago on using Skype in the library for virtual author visits. We decided it would be fun to get our book groups talking together over Skype. 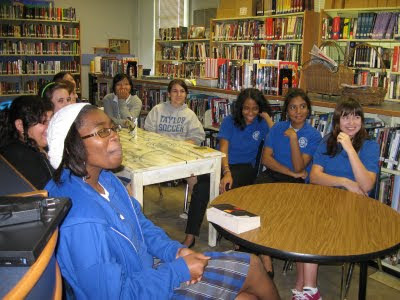 Today the library book group at Taylor spent 25 minutes talking with the book group from St. Scholastica. It was a lot of fun. The girls from each school took turns sharing books that they enjoyed reading. There were a number of books that the members from both schools liked. I wrote down some titles that they suggested that are not on the shelves at Taylor. Shiver was a real hit with them-a love story with werewolves--finally no vampires. I am definitely going to get that one for our school. When I went to tell the principal, Jaime Zapico, about how much fun we had, she said that two of the students just stopped to tell her all about it. It must have been a success. Here are some pictures. The first one is my book group, and the second one shows the screen with Tracey's book group.